With views ready to take your breath away, the North Downs is not only an Area of Outstanding Natural Beauty rich in woodland and grasslands, but also offers a journey through history and cultural heritage. Join our brand new walking weekend exploring and soaking up parts of the delightful Pilgrims and North Downs Way. The North Downs Way National Trail stretches through the Surrey Hills, from Farnham to Dover, covering a distance of 153 miles. Our scenic section on Saturday takes us from the village of Charing and onto the North Downs Way as we explore some of Kent’s most picturesque countryside via the ancient trackway of the Pilgrims’ Way. We follow the North Downs to Eastwell Manor country park, passing the ruins of St Mary’s Church where the illegitimate son of Richard III is believed to be buried. We then head on to the village of Boughton Lees, stopping for lunch at the Flying Horse Pub (own cost). Our trail then follows tracks of ancient pilgrims along the North Downs Way to Chilham, visiting Pilgrim’s Porch at Boughton Aluph Church, before heading up the Old Drovers trail into King Wood and through the grounds of Godmersham Park. It is here that Jane Austen got the inspiration for Mansfield Park and also where her brother lived. We finish in the medieval village of Chilham, one of the most beautiful villages in the county. Its square is surrounded by medieval timber framed buildings and its south flank faces the entrance to Chilham Castle. 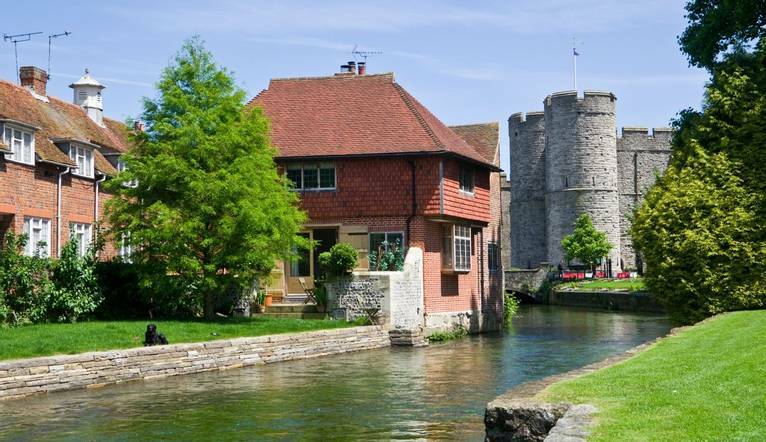 We visit the locations used in the Powell and Pressburgher film A Canterbury Tale which today is still used as a location for filming, and recently featured as the main setting for the BBC’s adaptation of Jane Austen’s Emma. On Sunday, we head back to Chilham and strike out onto the Pilgrims Way. Hear tales of Hilaire Belloc’s and Julia Cartwright’s routes to Canterbury as we ascend to Old Wives Lees through countryside evocative of the Garden of England, passing houses through orchards and woods to Nickel Farm. We stop for a light bite (own cost) in the village of Chartham Hatch, before continuing through No Man’s Orchard to Bigbury Camp, an iron-age hill fort where it is suggested Caesar defeated the British/Belgic tribes in 54BC. Our last couple of miles takes us through Harbledown, passing St Nicholas’s Chapel and the Black Princes Well, and then onto the final stretch into Canterbury. See the lead vault in the church of St Dunstan’s of Sir Thomas More before finishing late afternoon through the city walls and the medieval West Gate, through which pilgrims would have passed when the gate was constructed in 1490. Converted from a 17th century barn and complete with period features, our hotel is nestled in the Kent countryside, just a mile from Ashford town centre and on the doorstep of the North Downs. Modern facilities here include a bar and restaurant. Rooms all offer a flat screen TV, air-conditioning, tea/coffee-making facilities and a hairdryer. For important information relating to walking holidays, see Medical Conditions. The hotel is located off Junction 9 of the M20. Ashford International rail station is less than 2 miles away. Complimentary car parking is available. Two guided walks are included in the programme. The walking programme is graded easy to medium and you can expect to walk up to 18km (11.2 miles) on the first walk and around 12km (7.5 miles) on the second walk. A coach will be used to transfer you to the end point of the 1st walk and are included at the start and the end of the 2nd walk.